Mikhail Gorbachev is living proof that the word is mightier than the sword; that ideas, not armies, change the world. Dedicated to ridding humanity of the threat of nuclear annihilation, Gorbachev called for multilateral action to forge a common future at a time when the superpowers were at loggerheads. Two key words, Perestroika and Glasnost, characterised his philosophy - words that came to represent change and freedom in the universal consciousness. Gorbachev's radical thought ignited sweeping reforms in the Soviet Union, inspired liberation movements across Eastern Europe, and thawed decades of Cold War enmity. For Gorbachev, environmental matters have always been inextricably bound up with peace, security and social justice. The transition from head of state of the USSR to president of a non-governmental organisation, Green Cross International, was therefore a natural one. 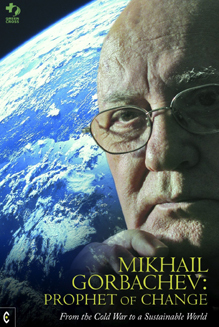 Mikhail Gorbachev: Prophet for Change traces the evolution of his vision, in particular the origins and outcomes of his environmental agenda, which belong to the important legacy of the changes Gorbachev initiated in the Soviet Union and the world. Without these critical initiatives, the many advances of today's global environmental movement would not have been possible. This anthology, featuring select speeches and writings, as well as tributes from political contemporaries and partners in the environmental and peace movements, has been compiled by Green Cross International to celebrate Gorbachev's 80th birthday. The tributes from colleagues and friends - ranging from political heavyweights George Bush and Margaret Thatcher to renowned champions of sustainability Maurice Strong and Achim Steiner - reflect the esteem in which Mikhail Gorbachev is held, and the special place he occupies in the history of our times. GREEN CROSS INTERNATIONAL (GCI) is an independent non-profit and non-governmental organisation that works to address the interconnected global challenges of security, poverty eradication and environmental degradation through a combination of high level advo- cacy and local projects. GCI is headquartered in Geneva and has a growing network of national offices in over 30 countries. The call for setting up a 'Red Cross' for the environment was made during the 1992 Earth Summit in Rio. Having stated that 'after the fall of the Berlin Wall the most pressing challenge for humanity relates to the relationship between man and nature', former Soviet President Mikhail Gorbachev was asked to lead this effort and became the founder of Green Cross International. MIKHAIL GORBACHEV, born in 1931, was General Secretary of the Communist Party of the USSR from 1985 to 1991. As head of state he introduced the radical turnaround of his country's foreign and internal policies which led to a complete transformation of the Eastern Bloc and Europe. He was awarded the Nobel Peace Prize in 1990, and in 1991 resigned as Head of State. He became President of the Gorbachev Foundation in 1992, and since 1993 he has been President of Green Cross International. He is the recipient of numerous awards and the author of many publications including Memoirs and Manifesto for the Earth.